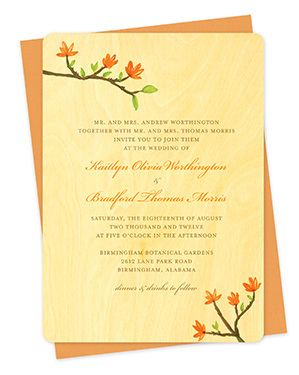 Lovely blooming branch wood veneer wedding invitations, perfect for a springtime celebration. Night Owl Paper Goods wood wedding suites are inspired by nature and designed to celebrate your unique style. Unlike traditional wedding invitation cards, no two of these invites are exactly alike, making them a one-of-a-kind keepsake. Also available : budget-friendly faux birch, printed on matte finish cardstock. Available in: Apricot (shown), Honeysuckle, Periwinkle, Persimmon, or a custom color. Available from : Lovely blooming branch wood veneer wedding invitations, perfect for a springtime celebration. Night Owl Paper Goods wood wedding suites are inspired by nature and designed to celebrate your unique style. Unlike traditional wedding invitation cards, no two of these invites are exactly alike, making them a one-of-a-kind keepsake. Also available : budget-friendly faux birch, printed on matte finish cardstock. Available in: Apricot (shown), Honeysuckle, Periwinkle, Persimmon, or a custom color.